Quidnet luxurious cottage with two master suites. This larger cottage sits up on Quidnet hill overlooking Sesachacha Pond and the Atlantic Ocean. With two master suites, this home is perfect for two smaller families. GraySeas’ panoramic water views, hydrangea and rose strewn private gardens with brick walks and wonderful decks, help make it the ultimate beach side vacation spot. 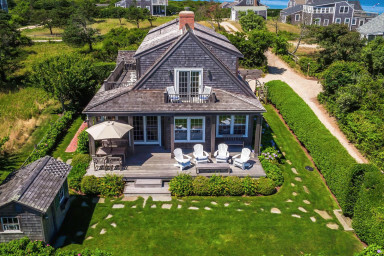 Imagine the ultimate beach side vacation with panoramic water views, hydrangea and rose strewn private gardens with brick walks and wonderful decks and spacious porches to enjoy it. GraySeas offers all of this plus 4 bedrooms, 4 bathrooms and elegantly comfortable living spaces throughout. On the first floor you are greeted by a beautiful open floor plan including a country French island kitchen with all of the amenities. The large living-room/dining-room area is full of wonderful, overstuffed couches and wicker furniture with French doors and wonderful windows to enjoy the sea view. This floor also includes two en-suite bedrooms. The first bedroom has twin beds and shares the bath with the public areas. The second spacious bedroom suite with the queen bed and writing alcove not only has a beautiful private outdoor brick patio and garden but offers an elegant master bath with double sinks in a granite vanity and a glass walled shower. The front porch has a breathtaking view of the ocean and pond and wonderful Adirondack chairs to relax in. An elegantly carved wooden balustrade adorns the staircase to the second floor which opens onto a seating area with its own private deck looking west; a perfect place to enjoy the sunset. Two spacious master suites open off of the sitting room. The larger master suite offers a King size four poster bed with sliding glass doors that open onto its own private deck looking at both ocean and pond views plus an incredible bathroom with vanity including a stone custom sink. The second master suite with king bed has water views and a wonderful bath. You will come for a vacation but the memories will stay in your heart forever.